WATERFORD — In a unanimous vote held Sunday, March 17, the congregation called the Rev. Doretta Colburn, of Waterford, to lead the ministry of the Waterford Congregational Church (WCC). 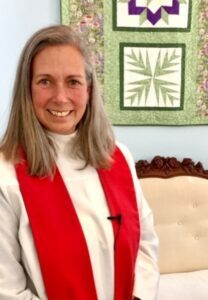 The new pastor has served in ministry with the United Church of Christ (UCC) for 24 years, first in Connecticut and most recently at the North Waterford Congregational Church before retiring in 2014. After the vote was announced, Rev. Colburn entered the sanctuary to cheers and a standing ovation. Colburn will be formally installed on Sunday, May 5, at a 2 p.m. service at the Church, to be followed by a reception at the Wilkins House. Colburn, 62, is a 1994 graduate of the Yale Divinity School. She and her husband, Ted, have owned and operated the Beech Hill Bison Farm in Waterford for 12 years. The farm, with its 38-head bison herd, has been in Mr. Colburn’s family for four generations, and its produce is certified organic by the Maine Organic Farmers and Gardeners Association (MOFGA). The Colburns have three daughters and five grandchildren between them. Mr. Colburn is a retired Coast Guard captain. The WCC has been without a settled pastor since late October, when the Rev. Petra Smyth resigned after six years in the pulpit, citing family reasons. Colburn has filled in on many Sundays since Smyth’s departure. A gifted storyteller and stirring speaker, Colburn quickly became a popular presence in the church. She says she felt a strong and immediate attraction for the Waterford Church, and that it “just felt right” to come out of retirement when the position became available. “The opportunity to offer hope in the face of life’s challenges and to help others find inner peace has always been my driving force within and outside the church,” she said. WCC Moderator Alan Struck says the church is thrilled to have Colburn as its pastor. “Her thoughts are nuanced in such a way that listeners have to assume responsibility for thinking how it pertains to them in their reality. And she does it all with a quiet strength and calm countenance that welcomes everyone,” Struck said. Colburn brings a wealth of varied experience. She has been a middle school science teacher and has participated on a substantial number of community boards over the years. She has served as president of local chapters of Rotary International in three different communities. Last year, with the slogan “Seeds of Hope,” she threw her hat in the ring to represent District 71 in the Maine State Legislature. Although the votes fell short, she ran an effective campaign in which she embraced the environment, education, and jobs for Maine as her key issues. Colburn’s roots in the community run deep, and she says she has always found it is important to be in the community as well as the church. She is currently a member of the Waterford Library and the Waterford World Fair boards. She is a founder and leader of the farmers’ markets, held every summer in the Waterford Common and Harrison, where she sells her produce, bison, and homemade breads. She runs the children’s program for the Waterford World’s Fair. Her daughter and son-in-law, Erin and Ed Grizone, own and operate the Good Health Is a Habit yoga and exercise studio in Waterford village. Two years ago, her sister and brother-in-law, Sharon and Preston Harrison, both artists, also moved to the village. Her ministries have included a small church of 12 in New Hartford, Connecticut, which she grew to more than 100 parishioners; serving as senior pastor of the large Mystic, Connecticut, church; and then the Mohegan Church in Uncasville, Connecticut, which also was the tribal church for the Mohegan tribe. Colburn was also the first female pastor to give the keynote address before 2,000 attendees at the Crystal Cathedral in Garden Grove, California.